Get out the chisel and get on the grid as the original portable Picross comes to 3DS Virtual Console, alongside some Spanish, black-and-white rubber-burning and plenty more. Mario's Picross (Game Boy, Nintendo, $3.99) — The classic picture crossword game makes its way across the pond after its 14th July release in Europe. Picross is always a solid purchase and this version is no exception, as our Mario's Picross review explains. Monochrome Racing (Nordcurrent, 500pts) — Minigame pedlars Nordcurrent surprise us with an old-school racing game with more than a touch of Micro Machines to it. Let's hope it can be that good. B Team - Episode 2: Ice and Venom (Subdued Games, 800pts/$7.99) — A follow-up to B Team - Episode I: Dust and Steel, this offers more of the same team-based strategy with all-new enemies and environments to destroy. We'll bring you a review soon. Play & Learn Spanish (Selectsoft, 800pts/$7.99) — The linguistic edutainment industry continues apace with another attempt at teaching Spanish to DSiWare fans following the average 4 TRAVELLERS: Play Spanish. Our own language experts are on the case. Go Fetch! 2 (Agetec, Inc., 500pts/$5) — Yes, it's a sequel to Go Fetch!, the DSiWare game about fetching a ball. Hopefully it fares better than its lacklustre predecessor, but only time — and our upcoming review — will tell. Pizza Quest – Join Scott on his epic quest for the world's best pizza ingredients. This video from CollegeHumor becomes available today at 3 p.m. Pacific time. I'm curious about Mario's Picross but it sounds really complicated. Not sure I would enjoy it. It's actually a lot more simple than it may seem at first, and it has a really easy-to-understand tutorial. On topic, I really wish Nintendo Video would overwrite the "What is Nintendo Video?" with this new CollegeHumor video. I'd like to keep the Bearshark one for a bit longer, too! @Link79 - It's not really that complicated. Once you get the hang of it, it's quite fun and a bit challenging. If you have a look at some picross videos on YouTube you'll get the idea of it. Ooh, Picross! I might try this one out! @Link79: You can always try it online for free (maybe here) to know what it plays like. Oh good there is a tutorial? lol it does seem super complicated but now that you guys mention it i will probably get this. Yes! This makes up for not getting Super Mario's Picross for Wii VC. Sounds like its a good one. I'll keep my eye on it. Still waiting for Mega Man. Hopefully next week. I just bought Game and Watch Gallery last week and I need to go and pre-order Starfox, so picross will have to wait a while. I wish we could get Picross for snes. I don't have a dsi or 3ds. Only 1 thing added to the eShop! Things are starting to get quite their quickly. Thanks for that sample of picross. I think I get the hang of it now. I may go ahead and get it. It'll be good for when I want a little a brain teaser. @Kholdstare No kidding. I would've thought that at least support for 3DSWare would've been a little more stable, seeing how (I think) it costs less then retail, but hey, I guess when you're a company that basically says screw you indie developers, you don't have lots of digital games flocking to your store. @Link79 - Picross is brilliant, but get DS versions of the game. Much easier to play with the stylus. Meh week other then Go! Fetch2! I might Dan if I like this VC version. A great intro to see if I will like this type of game since its only $4. Can't wait to play. No 3DSWare!!! I didn't buy a 3DS to download just black & white games. Hopefully, the pace of new games will pick up very-I mean last month-soon. So yeah, I'll be sure to get it, but that's about it for me this week. AH HECK YEAH! 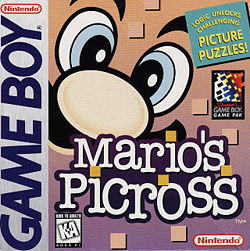 I loved Mario's Picross as a kid! YES, Mario's Picross!!! I'm a huge picross fan - I got Picross DS and Picross 3D, they're all amazing. OH, YEAH, MARIO'S PICROSS TIME!!! I was seriously worried we wouldn't even get it after we missed Mario's Super Picross...SO happy that's not the case! Since I have never played any of the Picross games before, this might be a good place to start for me. Yay for Picross! Boo for now 3DSWare! I'm glad we ended up getting this. I was half certain we wouldn't since we didn't get it on Wii VC. Seriously though, Nintendo needs to start churning out the 3DSWare. Mutant Mudds and rolling western would be a great start! Nothing for me again this week, aside from the new video. I'm not into picross at all, and even tossing Mario into the mix doesn't change that much. Mario's Picross (SGB) doesn't make up for not bringing Mario's Super Picross (SNES) to America. I'm not from the US but it's sad to see how these guys are so easily pleased with an inferior version. 2. not many people have ever played Mario's Super Picross (SNES) but many own Mario's Picross (SGB) already. 3. I wouldn't want this butchered 3DS port that has none of the original Super Game Boy's features. @SKTTR: Why are we happy? Simple! We're getting the version we grew up with, so bleh! I prefer virtual console games as opposed to 3DSware. 3DS ware doesn't do it for me as of now. I missed Picross the first time and will probably miss it again. BUt I am happy that some of you crazies are happy about it! I've never played either. As much as I'd like Mario's Super Picross, I'll take Mario's Picross. Mario's Super Picross would also cost $9 because it's a SNES import. This is $4. They're telling us about Nintendo Video releases? I thought those were supposed to be unpredictable. The US got an unannounced demo for Jam City Rollergirls on WiiWare in addition to Monochrome Racing today. I'm happy for those who care about Mario Picross, unfortunately I don't. What's butchered about it? You're playing it as if you were playing it on an original Game Boy Pocket which also didn't have SGB features (obviously). Nothing has been removed from the original cartridge. @sfog? Really? that's great! I've always sort of wondered about that game. DSiWare and WiiWare were slow and unreliable too in the beginning. The eshop has only been out a month or so. I'm guessing there just hasn't been time for developers to create, polish, test, and get their games through review yet for 3DSWare. I'm sure it will pick up eventually (though then people will be complaining about weeks of crap - good games take TIME)! @Everyone: Jam City RollerGirls demo is out too. @Sfog: Guess you beat me to it. Hey we actually got a Gameboy game this week. I'll pass though because I don't care for puzzle games that much. @LTR You can find it online but it is illegal and very easy to get viruses from download sites. I love Mario's Picross. I wish they would release the 2nd one outside of Japan. If they don't I'll probably import it someday. @SKTTR It's not a 'butchered' port at all, the only thing you miss by not playing it on a Super Game Boy is a fancy border and some colours. Pretty much the same as the Game Boy version of Donkey Kong which is already on there. The actual game is still there in its entirety and looks and plays the same as it would do on an original Game Boy or Game Boy Pocket. Not putting any good games on WiiWare or the Wii Virtual Console isn't going to get me to buy a 3DS. It's just going to make me resentful. I liked Mario Picross when I sampled it years ago. I never did get it and beat it, so I'll be sure to pick this up. This'll be a good time waster for me. Thanks for the link. I have always wondered how Picross worked, and everyone talks beauties of the DS version. It reminds me of Voltorb Flip on Pokemon HG/SS, which I love. Grrr... I hate being broke! I really want Mario's Picross lol I'm also hoping that the 3DS Picross hits America soon! Now what about relesing SNES Mario Picross NOA? @Mikau94 (45. ): I don't think it's illegal since it's such a basic concept. But if anyone has proof i can always take the link out of my comment, no problem. I just wanted to give people an easy way to try out the gameplay. And i'm far away from saying "don't pay for these games since you can play them online for free". There's a certain polish in Nintendo's Picross games that you can't get in online versions imo. In fact these games are among my absolute puzzle favourites. As for how secure the site i linked is i have to say i've got no clue. Everybody should have made security settings in his browser anyway so i don't really see your point here. @Link79 and @sinalefa: Nice to see you like it. Wow, one game for the Wii-ware and nothing on the VC? First they refuse to release the Operation Rainfall games, then they continue their trend of releasing fewer and fewer games over the Wii's virtual services... WHAT AM IS SUPPOSED TO BE PLAYING, NINTENDO?!? I don't own a 3DS (can't afford it), and I only have a Wii. Yay for Mario Picross! I've downloaded it and have played about a dozen puzzles already. When the game started up and the music started up, I went back in time. No Pacman?? I don't know about Picross for me. I've about had it with the Black & White games. The ones I have now don't interest me anymore. I'll take Colored gameboy games, and 3DSWare. If Picross turns out really good, I might consider picking it up. In 1.5 days, I've already played 6 hours of Mario's Picross. I picked it up basically because I had $5 left over from past purchases, and thought it was worth a shot. I can't stop playing it. It's perfect for a quick game to pass a couple of minutes, but that turns into a "just one more" time after time. I'm shocked to say this, but other than OoT, Mario's Picross is my favorite game on the 3DS (including Link's Awakening, which I like and recognize as the "better" game). Every single time I solve a puzzle, I catch myself grinning at the revealed image. Black/White, Green/White, whatever - this is a fun little game. any more gameboy color games?